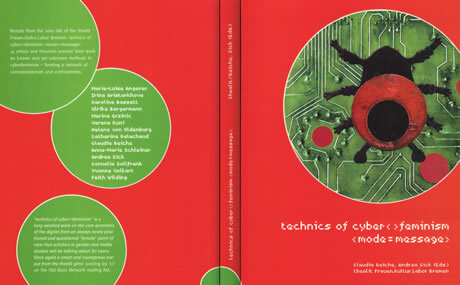 Results from the 2001 lab of the thealit Frauen.Kultur.Labor Bremen: technics of cyberfeminism . 14 artists and theorists present their work on known and yet unknown methods in cyberfeminism – forming a network of correspondences and controversies. Cyberfeminism was a question of technic? ‘technics’ bears at least two meanings in the field of cyberfeminsim, there may first come to mind the technical conditions that produced the ‘cyber’- prefixes to feminism: the digital medium in its specific forms of cyberspace and the conditions of electronic network-communication. What about the second notion of ‘technics’? this means furthermore something performed by ‘subjects’ revolutionary, psychoanalytic, mechanical etc, this second ‘technics’ figures as the mode of a feminist praxis: the structuring of cyberfeminist acts. how do these ‘technics’ interact, one is considered to be the condition of the other? Such interaction follows necessarily a paradoxical line: cyberfeminism has to articulate a new epistemological as well as a political field, including the ’subjects’ of these processes as elements of a radical praxis an automatic calculation.